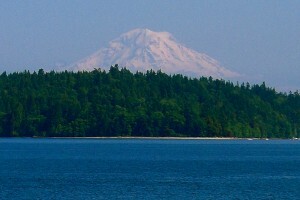 We packed up and headed out of Astoria by 9:30 AM. The tide was as low as either of us had ever seen it there; we’d had no idea it got so low that the sand bars in the middle of the river were exposed. A look at the tide charts suggests that this was just a middling low tide that we saw, too. 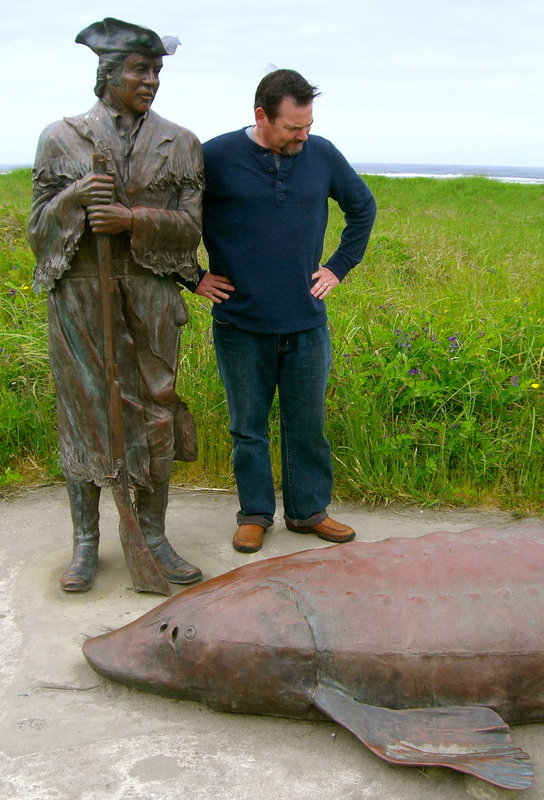 After crossing the bridge into Washington, we took 101 through Ilwaco and then up to Long Beach, in search of a bronze statue of Captain William Clark staring at a dead sturgeon. 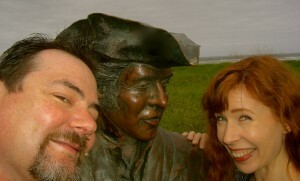 On our first road trip, I’d wanted to see this piece of art, but been thwarted by time demands. Not this time! I wasn’t sure exactly where along the 8-mile waterfront trail the statue was, so we kind of picked at random where to park. Fortunately, there was a map posted of the whole Discovery Trail, and we saw that we were about a mile from Capt. Clark. 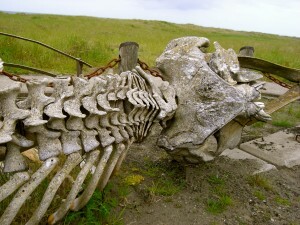 We hoofed it, taking in the remnants of a grey whale skeleton along the way. We didn’t get to see the bloated dead whale in Half Moon Bay, so this would have to do. The old grey whale, she ain’t what she used to be. Vandals have stolen half the bones. The one Clark once caught was much smaller. 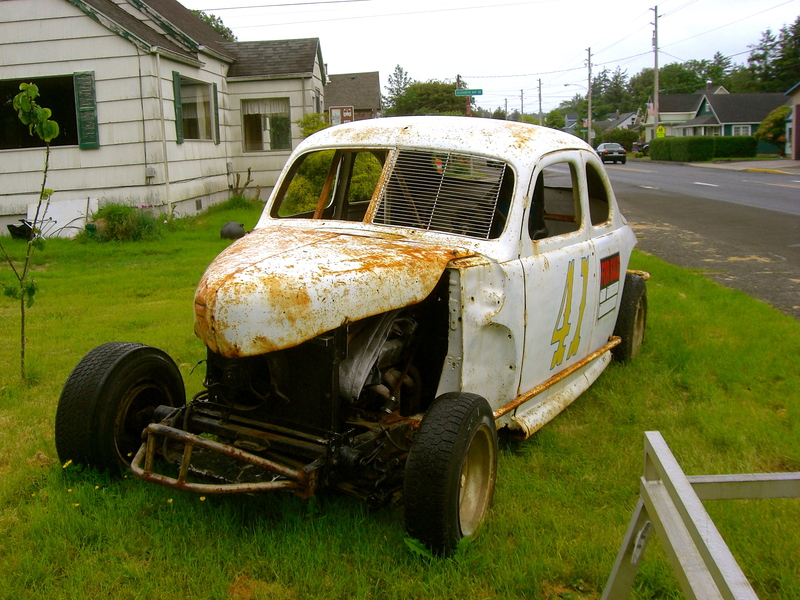 In Ilwaco, Clark spotted a 1941 Ford coupe for sale, that had been converted into a dirt racer – complete with a refrigerator shelf as a windscreen. The price was about four times as much as Clark would ever offer, so I don’t think I need to worry about this particular vehicle coming to live in our back yard. The refrigerator shelf is a nice touch. We’re guessing that it was made by someone during the 1930s or 40s, perhaps as a toy. 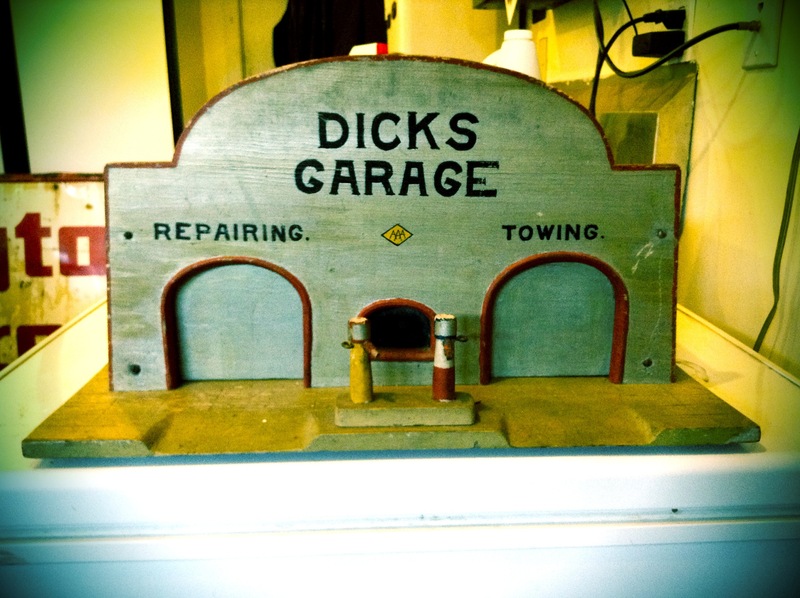 Clark speculated it could have been for a model railroad, but I think it’s too big. Back on the road for about an hour, and it was lunchtime. 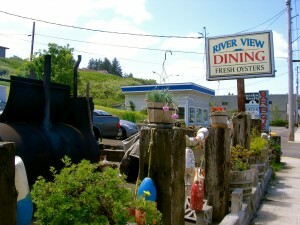 I’d scoped out online a place to eat, which turned out to be a huge hit with Clark: River View Dining, in South Bend, WA. 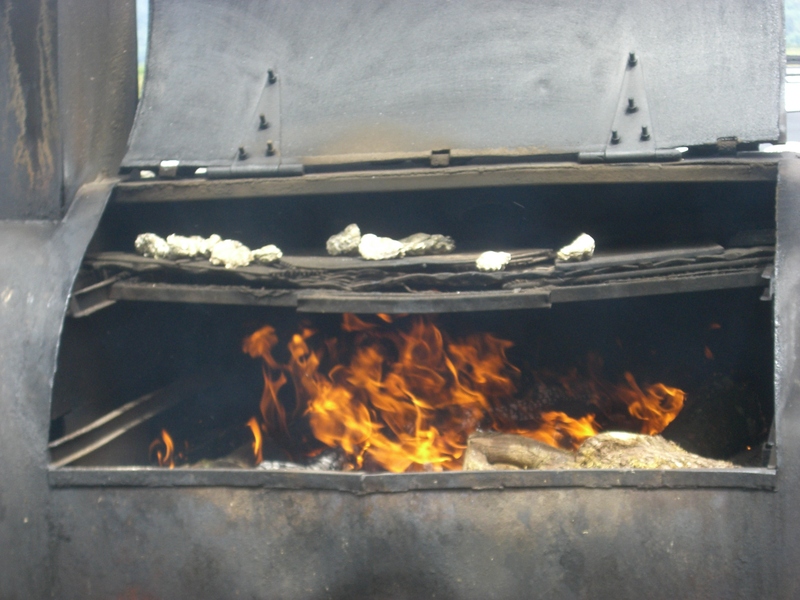 The specialty of the house is oysters grilled in a huge oil drum full of burning alder, and seasoned with a few different layers of sauce that we could only guess to be a sort of BBQ-mole, topped with something cilantro-based, a squeeze of lime, and we-don’t-know-what-else. The owner has a long, careful, particular process of how he makes them, which we got to watch from our window seat. 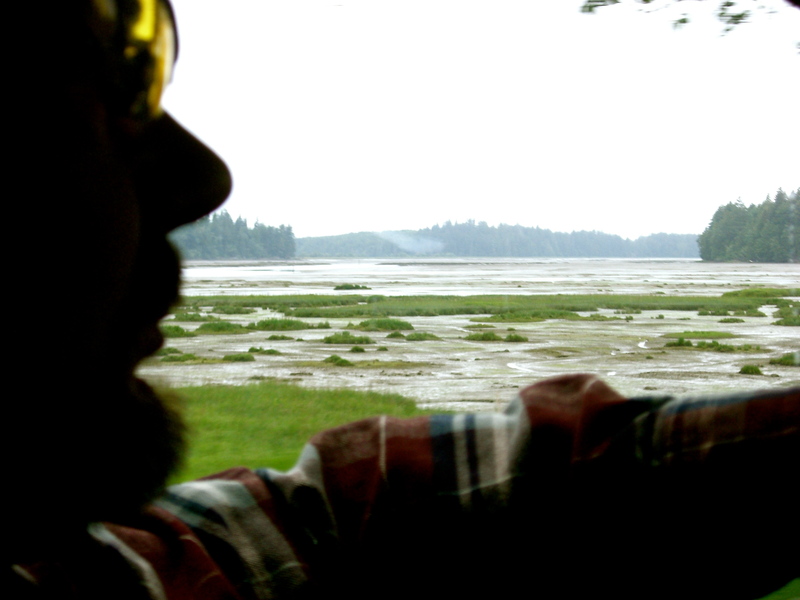 Mudflats mean we’re in home territory. The maestro at work with his secret potions. Well okay, at the moment he’s squeezing a lime, which isn’t so secret. But the others are. If you’re in South Bend, stop by. At one point, as the restaurant started to fill up for lunch, a woman and two teen girls came in and our maestro (who’d come in to get something) told them that if they had a schedule, they’d better stick to it. This confused the woman (understandably), and he tried to clarify by saying that he was unique. Which also seemed to leave her a little in the dark. After he went back outside, we chatted with her and explained that what he meant was that it would take a while to get food, as he had his methods and wasn’t going to be rushed. 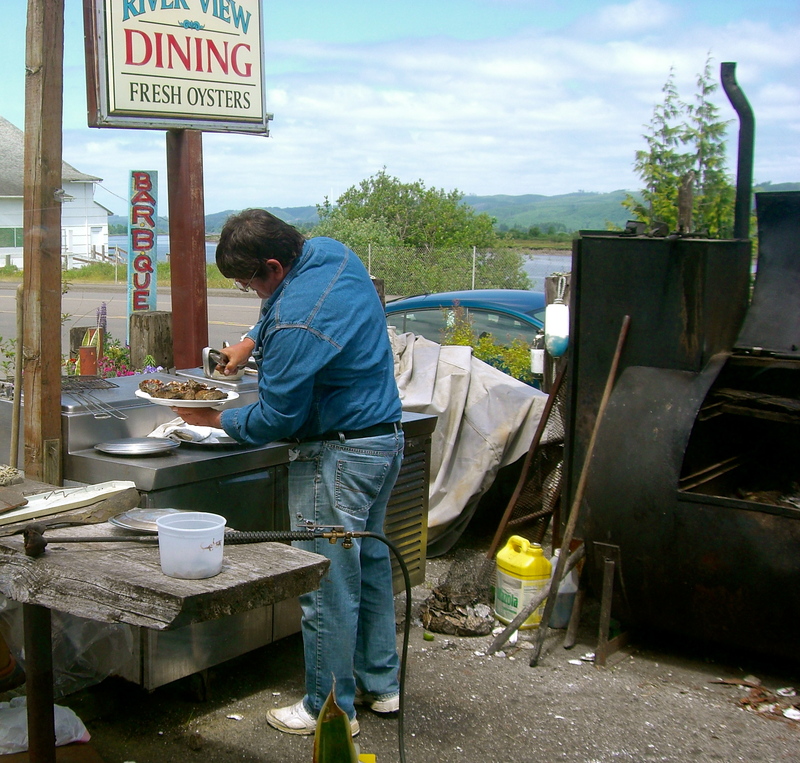 She was delighted by the whole vibe of the place (as were we), but it was clear that slow-roasted oysters were not The Thing for the teen girls. The woman left with regret. 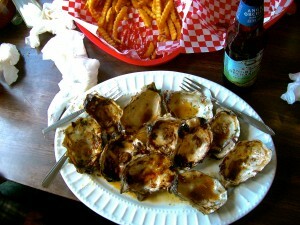 Our dozen oysters came, and were devoured. A second dozen was ordered, after we pooled our money to make sure we had enough cash. They don’t take credit cards. All gone. Now we are sad. Clark is now determined to replicate the oyster recipe at home, although we only have faint clues to what was in the various bowls and spray bottles the man used. The resulting flavor was subtle and savory, with a hint of brightness from the cilantro and lime. 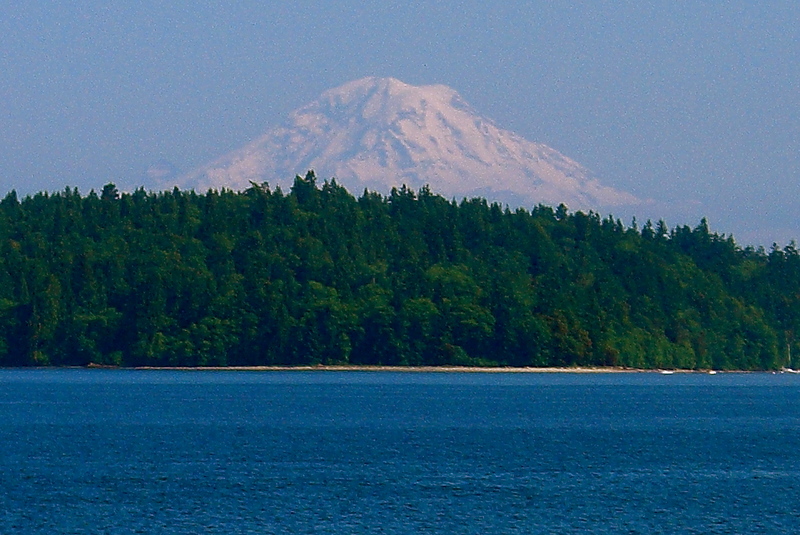 The sun came out while we were feasting, and the remainder of the drive up to Bremerton was all green trees and blue sky. 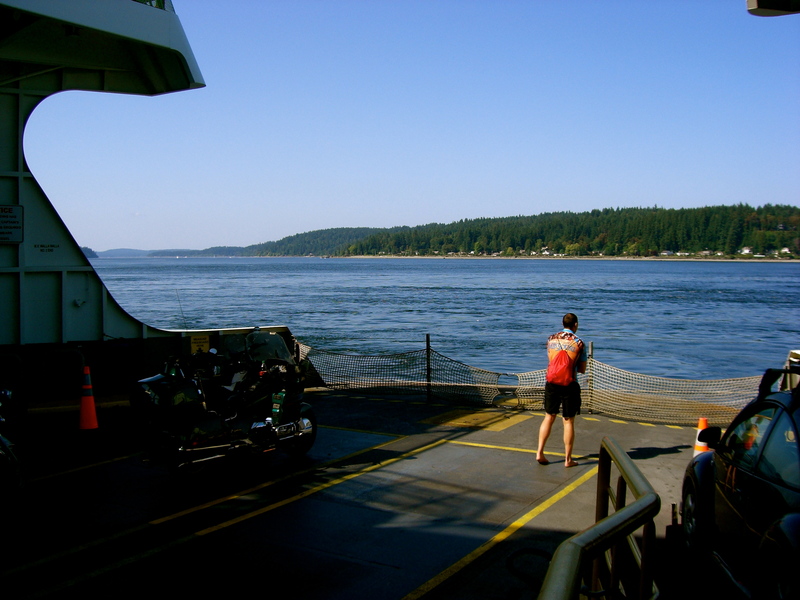 We got on the ferry with only a few minutes’ wait, and rumbled back to Seattle. The water and islands we passed were some of the same we’d seen from the window of our airplane, when we flew out two weeks earlier. Someone getting buffeted by the wind at the front of the ferry. And so to home, where we were greeted by neighbors who happened to be outside. Ed, holding a pint of beer and three diapers – he’d been on a diaper run from another neighbor’s house, where the kids were playing. Kelley, the cheery young realtor from across the street, who leaves tomorrow for Greece. Rocket scientist Jon, who made us stand in place while he went to get a magazine that had just come out, that had a photo of our neighborhood’s dragonfly in it. His wife Laurie and toddler son Calder joined our chatting gaggle. It’s awfully nice to come home and have such a warm greeting. The Subaru, however — that faithful steed we’d left stabled in the driveway — was sulking. It refused to start. It had also died at the end of our last road trip, although that time it blew off its radiator hose two blocks from home. But somehow, the car dying feels right; a worthy echo of the last trip. Perhaps the Subaru just wanted to be a part of things. Inside, the house felt large and clean and gloriously private. “I like this B&B best,” Clark said. Miles driven: 1,500 exactly. Weird. Weight gained: don’t wanna talk about it. Diet begins tomorrow. Scrumpy pitch report: no news is good news. Kirk tells me that Lucas hasn’t yet had a chance to talk to any higher-ups about it. The Requa Inn, in Requa, CA. Heceta Head Lighthouse, but only if we had a big group of friends with us. Marin Sun Farms, in Point Reyes Station, CA – who knew fried Brussels sprouts could be so delicious? 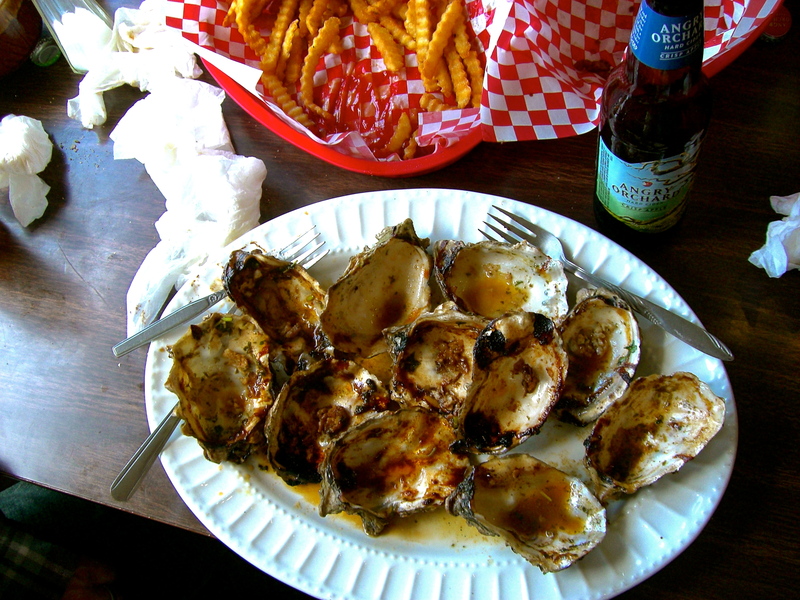 The Haute Enchilada, in Moss Landing, CA – much more than your typical Mexican restaurant. Dinner at the Requa Inn, Requa, CA – four courses, including my favorite for name alone: carrots stewed in their own juices. 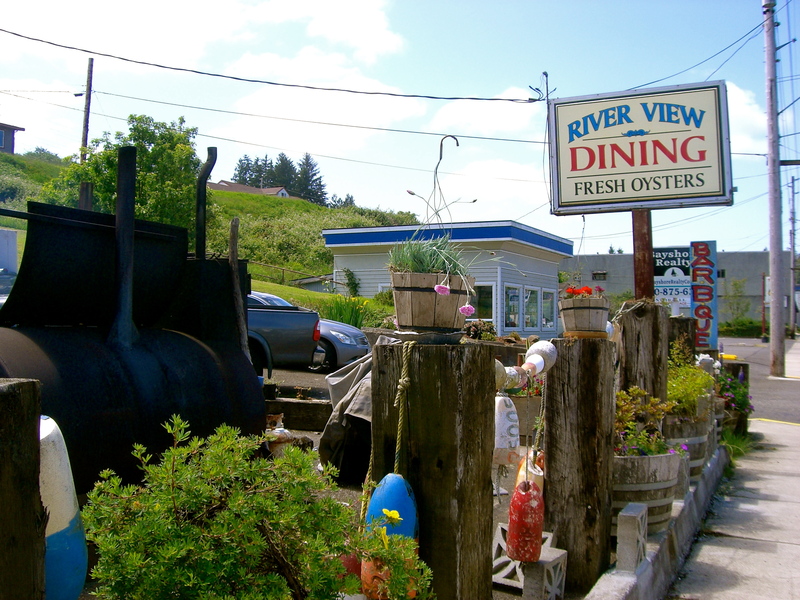 Homegrown Public House, Florence, OR – had a crazy-good porter (as in the beer) burger, with jalapenos. 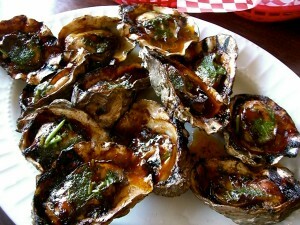 River View Dining, South Bend, WA – grilled oysters, house-style. No website, so I linked to Urban Spoon.